A clever and simple direct marketing campaign that empowers audiences to make informed decisions about regulatory risk and presents our client as the expert in overcoming data management challenges. The volatility that the 2008 financial crisis brought with it highlighted the need for timely and accurate information on risk and regulatory matters. Thomson Reuters Risk delivers a focused view of global regulatory compliance that empowers professionals to make confident and informed decisions on regulatory risk. Our client had produced a report to share some key industry findings, and asked our designers to help them share the information with an innovative direct marketing campaign. The campaign had to maximise audience engagement and present Thomson Reuters as the leading expert in their field. We brought the information to life with an impactful 3D infographic design that presents key information in way that is easy for audiences to digest, remember and share. The format was also versatile enough to allow the direct marketing piece to generate interest – both in the content and clever 3D design – and be used effectively in a variety of locations. The double-sided infographics introduce our client as an expert in their field by offering insightful advice with seven easy steps to follow to ensure compliance. On the other side, risk and regulation solutions offered by Thomson Reuters. To highlight the differences in content and make the piece stand out even more, we used different colour palettes on each side. 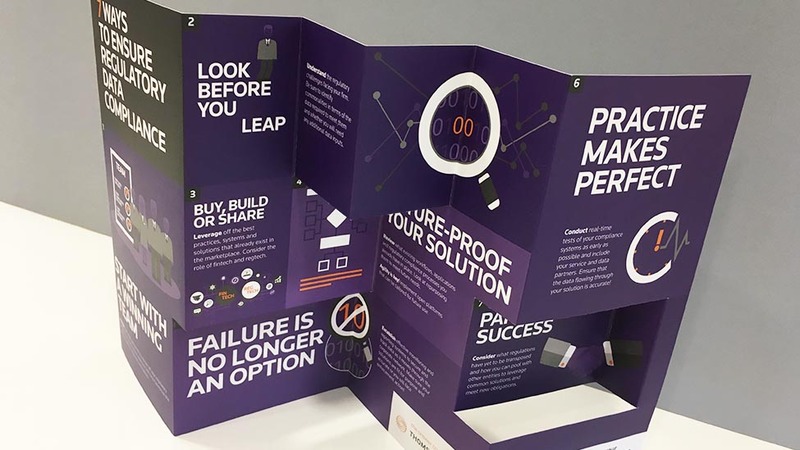 We suggested an oversized A4 format so that the concertina infographics could be used as a handout at trade shows, as well as a free-standing desk drop. The detailed content was written to appeal directly to the concerns of the audience, visually packaged in a way that made it clear, concise and compelling. This ensured the direct marketing campaign would create the strong connection our client was looking for, and encourage individuals to take the information away with them. We delivered 2,000 copies to our client’s London office, who in turn distributed them in a variety of ways to chief compliance officers, risk professionals, general counsel and compliance personnel in Financial Services, Banking and Healthcare. 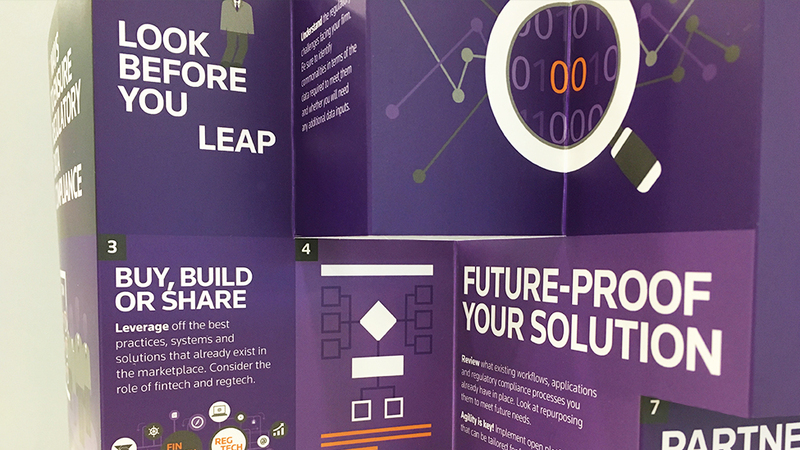 We received excellent feedback from Thomson Reuters about the direct marketing campaign, and have been closely working with them on more innovative collateral, for both printed and digital formats.